This post was written by Carolina Murcia, Biodiversity Heritage Library Product Development and Marketing Intern. Carolina Murcia. BHL Product Development and Marketing Intern. I am a designer. I am an artist. I am an illustrator. I am an amateur photographer, a daughter, a traveler, an adventurist, a niece, a walker, a cyclist, a friend, an intern, a professional, a foreigner, a Latina, a Colombian, a woman, a strong woman, a bilingual. I am a person that has grown and re-recognized myself since I started my journey with the Biodiversity Heritage Library. I know the value of real things and how lucky I am for the people and opportunities that life has placed my way. Over the past eight months, I served as the Biodiversity Heritage Library (BHL) Product Development and Marketing Intern for BHL at the Smithsonian Libraries, designing products for the BHL Store and creating promotional graphics for those products. As a designer, I enjoyed creating products, managing scientific illustrations, taking pictures inside the wonderful National Museum of Natural History, and creating and imagining different graphical styles to advertise the products in each collection. 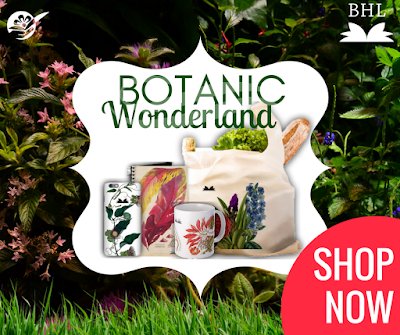 Botanic Wonderland products created for the BHL Store. Products and marketing materials designed by Carolina Murcia. For me, as a designer, the most magical part of my experience was exploring the amazing illustrations in the BHL collection. I was awed by the skills of these illustrators, and I saw that many of these early scientists were real artists. The lines of the drawings, the colors, the perspective – how the illustrators translated the movement of nature to a flat page that persists over the years – is just wonderful. I am grateful that my internship allowed me to experience every aspect of product development and marketing. I not only searched for and chose the images for a new collection in the store, but also edited each image to work within a given product, creating a complete family of products, and finally designed the marketing advertising graphics. I was involved from the beginning until the end of each collection, and for all of the products, I have a special affection. My favorite product collection, however, allowed me to stretch my creative skills. After working with all of these amazing books and their illustrations, I had the opportunity to create my own graphic line inspired by the BHL brand. For this collection, I started from scratch. I didn’t have any base illustration or book to start with. I designed all of the graphics from my own imagination. I wanted to find a way to enhance the logo and produce amazing products that didn’t just look like simple souvenirs but that can compete with big brands. I put the real and complete “me” in the graphic line, now I can say…. I am proud of the results. My hope is that BHL staff will use the products and be proud of having a t-shirt/Mug/Journal/etc. from BHL, knowing that it has design and style. I hope people really look twice every time they are near a BHL New Design Products. 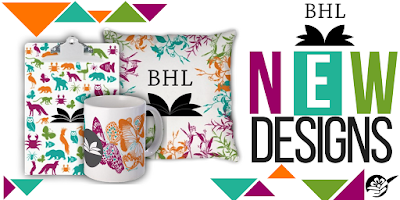 BHL New Design products. Products and promotional graphics designed by Carolina Murcia. So, after 8 months of learning, creating and designing, I decided that I liked everything about my experience. My favorite part of the internship was choosing and playing with the illustrations. I was like a kid with a new toy. I could spend hours just playing with the graphics, creating patterns, changing colors, etc. Working through the complete process of product development was the best way to develop my skills as a professional designer. I want to say thanks to BHL, but especially to my mentor and supervisor, Grace Costantino, for being patient, for giving me the chance to come to the Smithsonian Libraries, for trusting in my abilities, and for helping me develop my skills. It has been 8 happy months where I got to know people and places that I love…and I hope that I will see them again.